A Second Life Stint: I've been busy. British Prince William and Duchess Kate were visiting in Singapore for the last 2 days in my RL. Therefore, I've been busy. I am so proud of you, Singapore. For... trying this hard. I mean, which Singaporean doesn't like to exercise? Under the sun. 3.45pm. 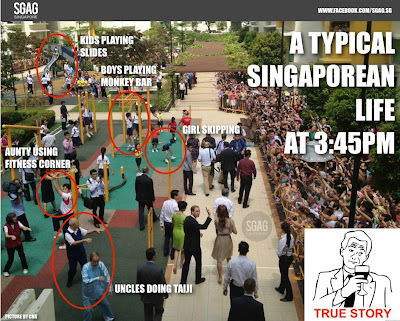 Any Singaporean in their right mind would absolutely do that if they could. Everyday. Especially if kids get to skip school at 3.45pm.